Compare prices on car hire in Sfax from all the major brands and find the best deals. When you book through us, unlimited mileage and insurance are always included in the price given. Sfax is also called Safaqis located on the east coast of Tunisia .The town borders the Gabèsbukta that leads out into the Mediterranean Sea and has a large fishing port. It exported goods such as olive oil and dates. Sfax is the capital of the province of Sfax is the second largest city in the country with a population of over 270 000 (2008). The city was founded in 849 AD Kr. on the ruins of the ancient cities Taparura and Thaenae belonging to the Phoenicians and Romans. 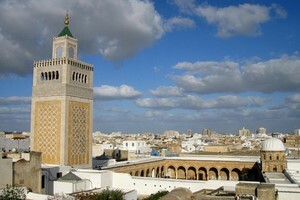 After visiting Sfax should head to the old town called Medina. Around the old town is an old city wall which is approx. 2 km long. The medina is the souks, which are markets with all kinds of services. One of the most famous souks are Blacksmith’s Souk, which means the smith’s souk, and is popular because of that part of the film The English Patient was filmed here. In the Archaeological Museum, one can see remnants of the cities Taparura and Thaenae. Sfax-Thyna International Airport is about. 6 km away.